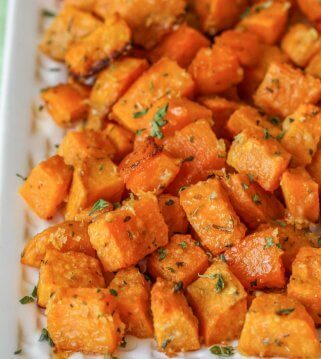 Who here loves sweet potatoes? I admit I was not a fan when I was younger, but now I LOVE them! Most people tend to consume sweet potatoes in the fall more than ever, especially at Thanksgiving time, but we like to enjoy them all year long. There really are so many ways to prepare and enjoy them. Some of our favorite sweet potato recipes include these Baked Parmesan Sweet Potatoes or these Pork Stuffed Sweet Potatoes. Today’s recipe is one that is perfect as a side dish any time of year, but will be especially perfect for Thanksgiving. It has the perfect mix of sweet and savory and was also very simple to make. The creamy sweet potatoes are amazing and it’s topped with a butter-y, brown sugar and pecan topping which is delicious! This Sweet Potato casserole is sure to become a holiday favorite and will be a hit with all of those that especially love this kind of potato. Delicious Sweet Potato Casserole - creamy sweet potatoes topped with a butter-y, brown sugar and pecan topping! 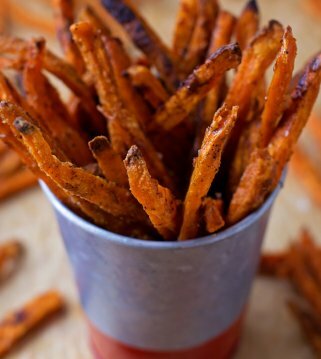 In a medium pot, cover sweet potatoes in water and cook over medium high heat until tender; drain and mash. In a large bowl, mix together the mashed potatoes, sugar, eggs, salt, butter, milk and vanilla extract, until smooth. Poor in a greased 9x13" baking dish. Mix the brown sugar and flour in a medium bowl and cut in the butter until the mixture is coarse. Stir in pecans, and sprinkle mixture over your sweet potato mixture. Bake at 325 for 30 minutes, or until the top is lightly brown. ENJOY! You are so welcome!! The topping is so good! Thank you! Four cups is how many potatoes??? Four c.is how many potatoes?? No. I haven’t. I will have to try! Thank you for sharing! Love this recipe. Made it for Christmas dinner everyone loved it. Was just wondering if the butter is sAlted or unsalted. Thank u.